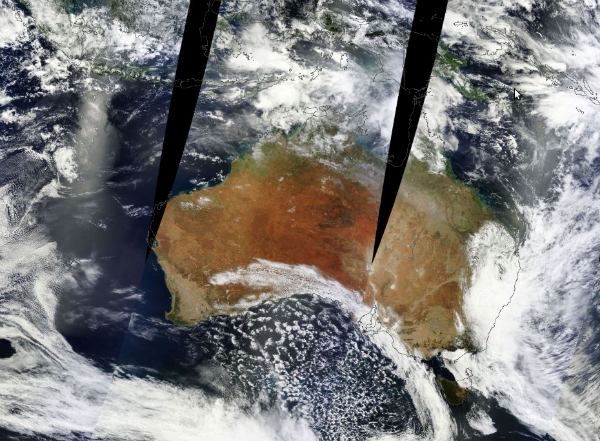 The remnants of Tropical Cyclone Oswald impacted Australia. Two people were missing and the body of a third person was recovered from raging floodwaters as severe storms pounded northeastern Australia on January 27, 2013 , forcing more than 1,000 to flee their homes. The Insurance Council of Australia declared a statewide catastrophe in several towns and cities and that major flood warnings had been issued. About 1-1.5 metres of rain was estimated to have fallen since the storms began. The rain depression is expected to finally mobilise southward overnight to begin tormenting the southeast. 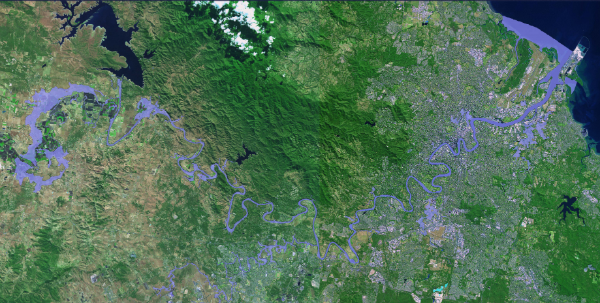 Heavy rains have left many rivers in Queensland flooded. Hundreds of people have been evacuated due to the flood risk by Burnett River in the towns of Gladstone and Bundaberg. Meteorologists in Australia warned of potential of flooding in Bundaberg that could cause rivers to rise to levels not reached in the last 70 years. The velocity of the water, the rises in the water levels and water speed of 40 knots means that literally houses, particularly in north Bundaberg, and maybe other locations, could be swept away. Authorities are saying the Burnett River already reached 9.15 m. Major flooding is also occurring at Mundubbera and Gayndah. According to Bureau of Meteorology, The Burnett River at Walla is currently around 22.9 m and beginning to rise as water from the upper Burnett arrives. The current level is above the December 2010 flood (20.10 m). People in flood prone or low-lying areas should consider evacuation or seek higher ground. Bundaberg was among dozens of towns devastated by floods in Queensland two years ago that claimed 35 lives. by the Bureau of Meteorology, Brisbane. Severe major flooding is being experienced in the Burnett Catchment. Record major flooding continues at Bundaberg with further rises at Bundaberg expected to continue into Tuesday. Major flooding is also occurring at Mundubbera and Gayndah. Major flooding is continuing in the Burnett River between Ceratodus and Gayndah. Major flooding has peaked at 23.0 metres at Mundubberra early Monday morning, which is slightly below the 1942 peak level of 23.6 metres. Flooding has also peaked at Gayndah during Monday morning. Moderate to major flooding is continuing across the Boyne and Auburn Rivers, and Barambah and Barkers Creeks. Flooding is easing in the upper reaches of these Rivers and Creeks. The Burnett River at Walla is currently around 22.9 metres and beginning to rise as water from the upper Burnett arrives. The current level is above the December 2010 flood (20.10 metres). Further river rises and levels above 23 metres are likely at Walla during Monday and Tuesday. River rises and major flooding are occurring in the Burnett River at Bundaberg. At 3 pm Monday, the river level at Bundaberg was at 9.20 metres and rising slowly. The Burnett River at Bundaberg is expected to continue rising during Monday and Tuesday as peak flows arrive from upstream. A peak above 9.20 metres is expected during late Tuesday or early Wednesday. The December 2010 flood level at Bundaberg was 7.92 metres. The 1942 flood reached 8.59 metres. The Fitzroy River, which runs through Rockhampton, is reported to be rising and is expected to reach peak above 9 m (30 feet), well in excess of the 7.92 m seen in 2011. The water levels of the Fitzroy are expected to rise sharply into next week as water arrives from upstream sources. About 900 homes were evacuated at Gladstone and several towns in the region were already isolated by the rising waters. Torrential rain topped a metre in 48 hours and has swollen the Boyne River to two metres higher than the previous record. More than 5 m of water is pouring over the spillway of the Awoonga Dam into the Boyne, just south of Gladstone. Queensland Premier Campbell Newman said a saddle dam off the Awoonga Dam is close to overflowing, which would put 500 homes in peril. In the next few days about 300mm of rain is expected in Wivenhoe Dam catchment, upstream of Brisbane, and coastal areas could get as much as 500mm. The Bremer River is expected to peak at 15 m and the Brisbane River's Port Office gauge is expected to hit 2.6 m. Both rivers will peak again in 24 hours due the high tides period. Ipswich Councillor Andrew Antoniolli said the region is expecting some 500 properties to experience some degree of inundation with residents requiring evacuation. Ipswich mayor Paul Pisasale said he was concerned that rainfall upstream in the Bremer River catchment was greater than recorded by the Weather Bureau. Residents in Murwillumbah and low-lying parts of Tweed Heads are being warned they may have to evacuate as the Tweed River rises. Tornadoes have damaged homes and injured at least 17 people in Bargara and Burrum Heads in Bundaberg region. Both townships were declared disaster areas. Another tornado hit the coastal town of Coonarr, about 20km south of Bundaberg. There were also reports overnight of tornado activity over Bribie Island north of Brisbane. Watch the video by Brisbane Times here. On the Sunshine Coast, one of the most spectacular aftermath of the storm has been ocean foam all over Alexandra Headland, including on the road. People are urged to use extreme caution and avoid approaching swift flowing rivers. Authorities warned residents in New South Wales to prepare for possible flash floods and strong winds of up to 100 km/h (60 mph) as the storm system moves further south. New area of convection hangs over the Gulf of Carpentaria, between the Northern Territory and Queensland. Warning centers have not reported any concern over the system developing into a tropical storm. 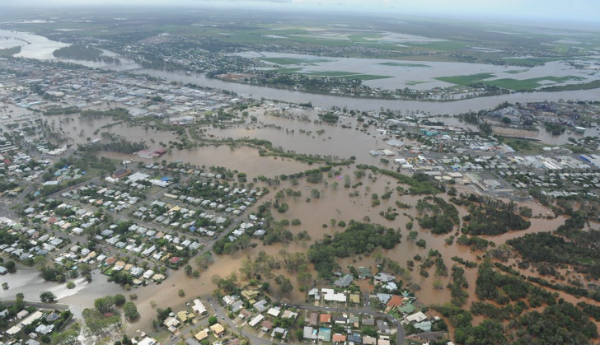 A massive inundation of Queensland and Victoria in 2011 killed 35 people and brought Brisbane to a standstill for several days, swamping some 30,000 homes.